I have developed a strong aversion against the term “VDI”. Basically because customers don’t understand what VDI means, caused by the simple fact that the people who explain this to the customers (the people in IT) don’t understand it either. The term VDI is roughly 7 years old. Back then we presumed it was the right term to use, and maybe it was. But time has changed and I strongly believe we are ready for some change. Are you ready for some virtual desktop word bingo? I remember the first VDI implementation I came across roughly 7 years ago, the NEC VirtualPC Center (VPCC). Being one of the first implementations the solution wasn’t mature enough to implement on a large scale, but the name described exactly what it did. VPCC virtualized the PC, ran a desktop operating system and provided access to that machine via a remoting protocol like ICA or RDP (I really can’t remember). And that’s exactly what we’re referring to if we’re talking about VDI, a virtualized desktop operating system that users can access from a different location. VPCC quickly dropped off my radar and I forgot all about it, until a few years ago: VDI was a hype. What changed in the mean time? Some improvements on the hypervisor, broker and remoting protocol. And “one more thing”… marketing got involved. 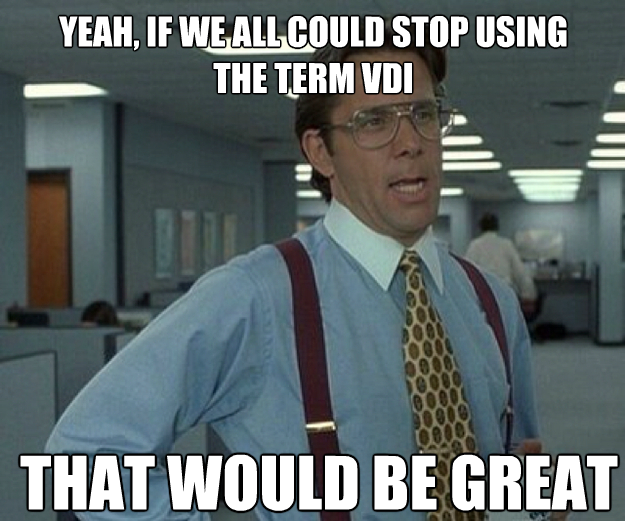 The problem with the abbreviation VDI is the word desktop. In the abbreviation VDI we’re referring to is the desktop operating system (OS), while most people have another association with the word desktop: the background image with shortcuts introduced in Microsoft Windows 95 (okay Windows 3.0 but no one called it a desktop back then). As a result we’re talking about two completely different things; a desktop OS and a background image. Customers are asking for a VDI, “I want a VDI”, while they actually want to access a desktop: a background image with icons. When I’m talking about a desktop I’m talking about a background with shortcuts. A “desktop” computer doesn’t exist, either it’s a workstation (a solid brick on your desk) or it’s a laptop (a mobile device). Using the word desktop when referring to a computer is too confusing. As a generic term for both a workstation and a laptop we could use “personal computer or PC” instead. Citrix has two products in their offering that provide access to remote applications and desktops, Citrix XenApp and Citrix XenDesktop. It’s good to understand the similarities and differences. 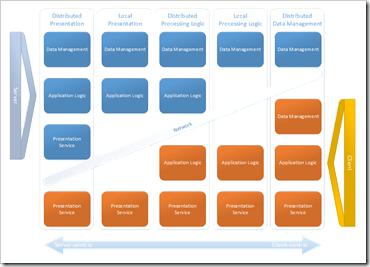 The client/server model by Gartner describes different models for application delivery. 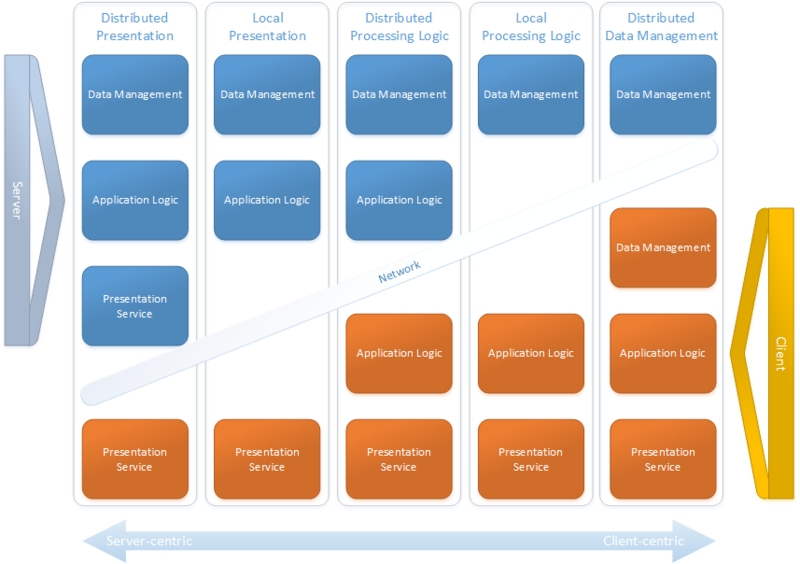 There is an assumption that running an application requires three components: the data, the application itself and its presentation. If the application runs on your workstation and the data is on the server it’s called “distributed data management”, you can compare this with running Microsoft Word on your computer while the document is stored on a server. Now imagine you view your desktop via a remoting protocol like VNC: the computer now acts as a VNC “server” and presents the content on the local screen and on the VNC “client”. That’s distributed presentation. In 2007 Citrix renamed their most important (commercial) product from Presentation Server to XenApp. From a marketing perspective that made sense, but not from a functional (or logical) perspective. Citrix XenApp is an implementation of local/distributed presentation: it runs the application on the server and the result is presented on the screen of the client. This is also known as “presentation virtualization”. Nonetheless some clever guys at Citrix figured the name XenApp would be better than Presentation Server, to fit in the new Xen naming strategy. 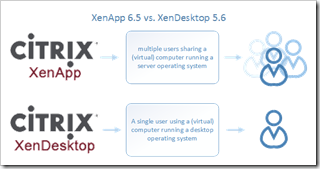 I you want to sell a new product XenDesktop, the name XenApp makes sense. 90% of the customers think that if you want to access applications from a datacenter you need XenApp and if you want a desktop you need XenDesktop. While in reality both products provide access to both. I wrote about this in an earlier article. Beside some technical differences (IMA vs FMA, more) the main difference is that XenApp provides access to a multi-user execution environment while XenDesktop provides access to a single-user execution environment. Let me explain with an example, a discussion between a customer and an IT guy. Hi IT guy! I want to access my applications anytime and anywhere. …from a safe and reliable environment (a datacenter).The environment needs to be scalable, flexible, etc. access to your applications from every location at any time. Great! I want the ability to run some VDI’s as well. VDI’s? You want to access desktops anytime and anywhere? You want to access a desktop anytime and anywhere, a background image with shortcuts on it? VDI is not the only term we’re using for virtual desktop environments, we tend to use a whole bunch of them to describe nearly the same. Understanding the meaning of a term allows you to explain it to your customer. If you don’t fully comprehend a definition, how can you explain this to a customer effectively? Execution platform is an environment where applications are executed (or computed). An applications does not run, it is executed by a computer. Resources like the processor, memory and disk of the computer are used to run the processes (and threads) of the application. An execution platform where resources are used by one user is called a single user execution platform (SEP) while an execution platform where resources are shared by multiple users is called a multiuser execution platform (MEP). Server Based Computing (SBC) is one of the oldest terms, it describes the technology to share resources on a server to run applications or desktops. Microsoft Remote Desktop Services (previously Terminal Services) enables a machine running a Windows Server operating system to share its resources with multiple users, a multiuser execution platform. Citrix XenApp improves the functionality, security, flexibility and performance in a SBC environment. Virtual desktop / application is used to refer to a desktop or application that runs in a virtualized environment. What it doesn’t tell is what type of virtualization is referred to. It could be 1) the computer hosting the desktop / application is “virtualized” or 2) the desktop / application runs on a computer hosted on another location or, in case of an application, 3) the application is encapsulated in an isolated execution (called application virtualization)? When a computer is “virtualized” we usually refer to virtualizing a computer using a hypervisor like Citrix XenServer (or VMware ESX / Microsoft Hyper-V). But we might as well refer to presentation virtualization: the desktop / application is executed on a different computer (for instance in a datacenter) while the user’s computer shows the GUI of the application. Virtual is a word that can be explained quite broad and is interpreted freely to describe complex matters in a simple way. Basically what we’re saying is “we’re applying some virtual magic and now it’s safer / better / faster / more interoperable. There’s no way we can explain what we’re actually doing”. Virtual shared / private / hosted desktop are commonly used terms to describe where a desktop is located. A virtual hosted desktop is referring to a desktop that’s hosted on a computer in a different location than the user’s computer. However it doesn’t say if this is a shared or private computer, although most people are referring to a private computer. Published application / desktop is the terminology used by Citrix to describe applications or desktops that are hosted on a computer, server or workstation, to one or more users via the ICA remoting protocol . The applications or desktops are published from a collection of servers (a farm or site) where users, based on their group membership, are able to see the available resources. A published application or desktop is in equal to a hosted application / desktop. VM Hosted Application is a Citrix proprietary name for a hosted private application controlled via Citrix XenDesktop (although Quest Dell vWorkspace offers the same functionality). An application running on a virtual (VM) Windows desktop operating system that is available on remote machines via the Citrix ICA protocol. Typically this is used for applications that can’t run in a hosted shared environment. Stop using the term VDI, thank you! And while we’re at it, stop using the word virtual to describe hosted applications or desktops. If you virtualize it confuses the hell out of customers. I’m noticing that customers are struggling to understand what technologies are available and how they can leverage them. With the upcoming release of Project Excalibur (Citrix XenDesktop 7?) customers will have to face yet another major change: XenApp and XenDesktop will be integrated into one product (the name XenApp will be ditched?). How can we expect customers to understand the impact if they are unaware of what XenApp and XenDesktop is? How does this virtual-desktop-word-bingo affect VMware customers? Well, it doesn’t really. Ignorance is bliss. VMware has no technology to provide access to “seamless“ applications like Citrix. Not from a multi-user execution platform (like a Windows Remote Desktop Server / Terminal Server) nor from a single user execution platform (like a Windows desktop OS like Windows 7). VMware does provide access to a desktop on a virtualized computer (running a desktop OS) with their VMware View (now VMware Horizon) product. Should we abandon the term VDI? Should we replace VDI with HPCI and HPSI? Should we stop using the word virtual to describe hosted applications and desktops? I’ve asked several leading experts from the field to read the article in advance and share their thoughts about the subject, you can read their comments below. I understand your motivation for the proposed name change and from an objective standpoint you are right – and I like the concept. The difficult/impossible thing will be to convince the marketing departments of the big players (Citrix, VMware, and many others) to agree on one (!) name schema and adhere to it. Because a bigger problem than having terms that match reality only partly is having multiple conflicting and overlapping terms for the same thing. I agree that removing “virtual” is the right thing to do as “virtual desktops” can run on both physical PCs (RemotePC/Blade PCs) and physical RDS/XenApp boxes. There is additional ambiguity as “virtual” generally implies that there is an underlying Hypervisor! If “VDI” is split into HPCI and HSCI, I think that we’ll still need term that describes them collectively, i.e. the “desktop virtualisation” of today. The majority of solutions we put in place/recommend are primarily HSCI (XenApp) with HPCI for particular use-cases. Therefore, will we be back to square one and ambiguity?! I think that the actual issue is that the existing VDI terminology is used to describe both the technical architecture (XenDesktop/View) and solution architecture (Desktop Virtualisation). This is marketing at its worst. You pick this up with the “I’m noticing that customers are struggling to understand what technologies are available and how they can leverage them” statement. I think it’s a good step to make these name changes so everybody can compare apples with apples although I do think the current names are partly based on marketing involvement there will be just more confusing names so where to stop…? The major problem is we’re living in rapidly changing times which doesn’t allow us on consenting on a standard especially not on these kind of naming conventions. Drop the I at the end and change computer to desktop, it’s not a computer, it’s a desktop. A 4 letter acronym has far less chance of being adopted, e.g. PDI instead of HPCI and SDI instead of HSCI.Would an easier work around be to just call SBC VDI too? As in VDI is not SBC and VDI technologies? Not sure I agree with this comment, with view you can also integrate Microsoft RDS so they have a similar issue, you’d have to buy VDI licenses to use view but in that scenario it’s brokering hosted shared desktops. VMware does provide access to a desktop on a virtualized computer (running a desktop OS) with their VMware View product. With App-V and UEV (although pants now) they are starting to rub shoulders with Citrix and VMware and shouldn’t be discredited in my opinion. Should we replace VDI with HPCI and HSCI? The term VDI is overused and misunderstood. As you say, customers and engineers new to the technologies are confused as to what it is they require to achieve their desired goal. I have seen cases where XenDesktop has been chosen before any project requirements were even laid out and have responded to confused people on the Citrix forums as well. New terminology is required and I think it is a good start to get the community using it but getting wider adoption is going to be a challenge and may not happen unless some of the large vendors start using it. After reading the article and the comments from the some of the leading experts, do you have anything to add? If so, don’t hesitate to leave a comment. Great suggestions and great points made. However whatever acronym is used, users/the business will always get confused make assumptions and get it wrong. Even after having it explained they go on to relay it incorrectly. Having another set of acronyms whilst accurate and thus more appropriate wont now help, in addition there will be new capabilities demanding new terminology around the corner anyway. What would be better is coming up with a way that the industry as a whole (or partially at least) can collectively come up with the most accurate terminology for the next iteration of capabilities rather than just letting acronym evolution allowing something that’s not correct take hold. There needs to be a naming standards board or something like it! In the last couple of years I have not only heard Citrix terminology, or Microsoft (hyper)terminology (or VMWare’s) – I also noticed various IT providers come up with their own inventions (like ‘DeskCare’ or ‘Performance Blocks’). And you know what? You can literally sell anything to anybody; as long as the story matches the desires of the customer. It really doesn’t matter what it is called – as long as it can be presented as the absolute solution for everything that annoyed users or managers in the past (a bit like the ‘war wins elections’ adagium – and it can be as expensive). Having said that – it does prove the need for a reliable IT-partner and a well worked-out use case for any organisation that wants to adopt any kind of virtualization at all. It just is so vital that companies or organisations define their needs and strategy and (with the help of a reliable partner) translates that into technology that will provide the suitable answer for that organisation – never mind which company delivers it, or which partner will install and configure it and not even which partner will maintain and service it. I believe it is essential that the customer defines their needs first. No buzzwords! Just state in which situation you need which functionality – today, in the next two years and how you think this will evolve for your organisation in the next 5 years. And be as specific as possible (please). Of course each vendor comes up with there own unique terminology, it makes there product “unique” and as such a unique selling point. We should strive to be a reliable IT-partner, the customer should demand good use (and business) cases. But as you said, you can sell anything to anybody. Most partners sell the product they get the most commission of and customers want to hear a good story. Entertaining read Ingmar, VDI has become a marketing term, just like the term Cloud. They are often used (and misused) to cover various solutions and services, but the real technology behind it is smoke and mirrors for most people. And that’s fine, but sometimes (way to often) this leads to wrong descisions made by people misunderstanding this terms or just because they want to be part of the hype. Nice post as it tells the story of VDI very well, I don’t think the new terms will take off, but they can certainly be used as an reference of what the term VDI now a day is, so thank you for the detailed summary. Spot on Bram! VDI has become a marketing term (hype > buzz) which is driven by sales, not technology. This might was fine when the technology wasn’t where it is today: hybrid solutions that offer access to both private and shared environments. Let’s see if we, as the community experts, can come up with a more easy to understand term. First off… Great article and nicely written! Both the terms VDI and Virtual (to name a few) have been around for quite a while now, unfortunately in many cases they’re misunderstood and or just explained wrong. But they have been persistent over the past few years and are known by most, renaming them now will only add to the confusion if you ask me. We all criticize Citrix for changing their product names every few years, at least that’s what I hear (a lot) from our customers. Let’s not make the same mistake, miss-conceptions are here to stay no matter what you name a technology or product. If change is needed I think we need to focus on re-defining the terminology in general and explaining it the right way, whether it be face to face, online, printed… whatever. The same goes for product specific definitions as well. Customers will always misinterpret terms and technology when they want or need something new and go out for a Google, never mind if they are System Admins, CIO’s, CEO’s etc… It’s up to us, a name change won’t be sufficient. To go short… I agree with Tom and Rene. IMHO change is needed and WE should focus on re-defining the terminology. Marketing won’t do it for us, CEO’s and CIO’s don’t care and …dare I say it… most sysadmin’s don’t get it. So we should start using terminology that’s more appropriate and general (product independent).